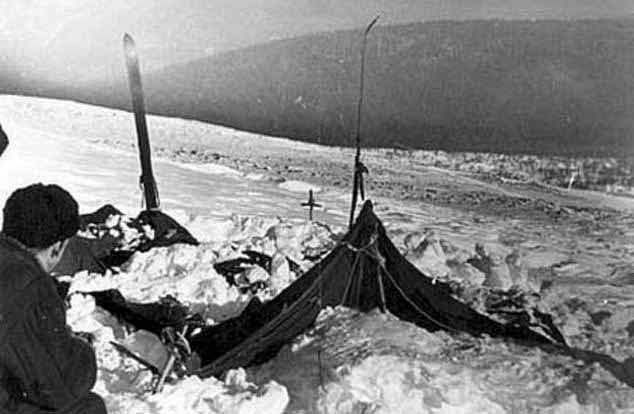 A February 20, 1959 photograph of the missing skiers collapsed tent. Peering through the windswept snow on a dark February day, the rescue party finally came on the first sign of life — the flapping remains of a tent pitched on ski poles on an uppermost slope of Kholat Syakhl, ‘Mountain of the Dead’ in the native language of northern Siberia. But where were the nine young Russian students who should have been sheltering beneath the canvas? Curiosity turned to mystery as human tracks were seen in the snow heading downhill away from the tent in single file for a third of a mile... barefoot human tracks. In temperatures of minus 24! And mystery became horror when an inspection of the tent showed its front flaps still buttoned tightly together but huge knife slashes down the sides — through which the occupants apparently fled. Inside was like the Mary Celeste, with everything intact — warm clothes, waterproof jackets, blankets and sweaters that would have been essential to survive in the Siberian weather; plus cameras, diaries and cooking utensils, all apparently abandoned in a moment of madness. So began the story of what became known as the Dyatlov Pass Incident, one that has baffled the world for more than half a century since whatever horrific tragedy overtook the nine in February 1959. They had been missing for almost a month after trekking out into the bleak wildness of the Ural mountains — seven men and two women, all of them fit, hardy and experienced hikers on what was supposed to be a short and invigorating break from their graduate studies. ... The first bodies — frostbitten and frozen stiff — were discovered lying in the snow on flat land near a river, a mile from the tent, next to the remains of a long burnt-out fire. Nearby, a search dog sniffed out the remains of Zina Kolmogorova, 22, under four inches of snow, and then that of Rustem Slobodin. The bodies were in a line 200 yards apart, as if they had been trying to crawl behind each other back up to the shelter of the tent, but never made it. Stranger still, odd bits of their clothing contained higher than normal levels of radiation. Indeed, post-mortem examinations of all nine bodies threw up a string of bewildering anomalies. Why were some fully clothed, but others nearly naked? Most disconcerting of all was Lyudmilla Dubinina’s body, which was missing her tongue and eyes. ... The official Soviet investigator into the tragedy, Lev Ivanov, could find no answers. He concluded in his hastily composed report that all nine deaths had been caused by what he described as ‘an unknown elemental force which they were unable to overcome’. Privately, he told people he thought they’d been killed by aliens in a UFO. And that was where official investigations ended. Case closed. Access to the entire area was sealed off from prying eyes for the next four years, by which time the authorities believed this incident would have disappeared off the radar, as many strange happenings did in the old Soviet empire. Unfortunately, the story above is misleading. It appears that the tent may have been hit by an avalanche, and that the group fled the tent. Some apparently started a fire, while a smaller group went to look for help. The bodies found after the initial search--under 15 feet of snow--were at the bottom of ravine, where they probably fell while looking for help. As for the lack of clothes, it is well known that one of the stages of hypothermia involves the body opening up blood vessels in a last ditch attempt to warm the body, which makes the victims suddenly feel overwhelmingly hot, and many will remove their clothes as a result. Nevertheless, Russian authorities are going to reopen their investigation into the incident.